We even have one that rolls MORE balls at once! Check out that one HERE. Next find some eyeballs! 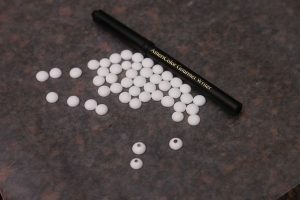 I got these sugar dots from Bakerella that I just had to draw on a pupil (with food safe markers), but there are several eyeball choices;)! You can find them at your local craft store or even make them yourself if you are feeling extra crafty with some royal icing. Just do this step first so you are ready to go! 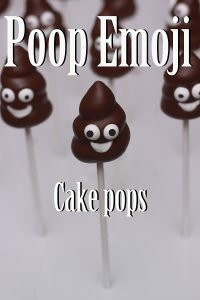 Next, it is time to form the Poop Cake Pops! I did this by packing a piping bag with cake dough! I used a tip adaptor (without a tip) but if you don’t have those just a 1/2 inch or so snip off the end will work! With the piping bag placed straight up and down against some wax paper start swirling! If you try to make too tight of swirls the cake dough will crack more then if you swirl it a little more loosely. Once I made a full 3 turns around I lifted up and released pressure. It ends with a flat spot, so I just formed it into a point. You can cover these with plastic wrap while you get your chocolate ready. You don’t want them to dry out. I used chocolate almond bark and melted it down in the microwave. 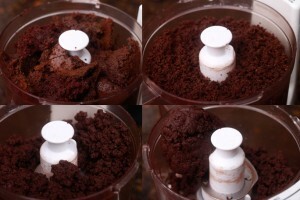 Place the chocolate in a microwave safe dish and heat it for 1 minute on 50% power. Take it out and stir. 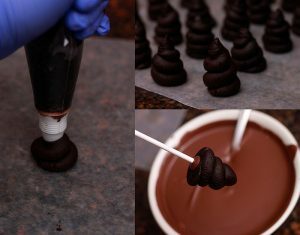 If it is not melted, put it back in, for 30 second increments until the chocolate is completely melted. 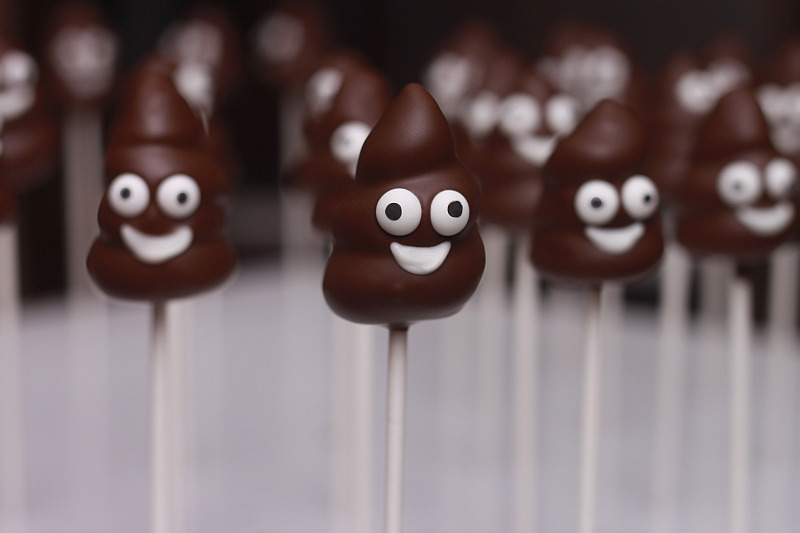 Now dip the stick into the chocolate, then into the base of the poop cake pop 🙂 Then submerge the entire pop into the chocolate at gently tap off the excess.